Kia has taken big strides forward in quality and in sales in recent years. Since 2008, Kia’s U.S. market share has surged by nearly 50% and residual values have increased by 38%. Kia is now offering a more diverse product lineup adding hybrid and turbocharged engines to the mix. The 2011 Kia Sportage SX features a 2.0-liter 260 horsepower four-cylinder engine. The direct-injected turbocharged engine produces a stout 269 pound-feet of torque. This is the most powerful four-cylinder engine offered in the compact SUV class and 84 horsepower more than the normally aspirated 2011 Sportage. A different version of this turbocharged engine is also found in the Kia Optima. The Sportage SX has more power than several premium compact turbocharged four-cylinder SUVs such as the 2011 Acura RDX (237 horsepower) and 2012 Land Rover Evoque (237 horsepower) and costs $7,000-$15,000 less than these models in their entry level trim. Its engine is also more powerful than the 2.0-liter 237 horsepower four-cylinder EcoBoost engine that will be found in the 2012 Ford Explorer and other Ford models. Despite its great power, the Sportage SX’s acceleration is not as fast you as you might think. According to Motor Trend, with front wheel drive the Sportage SX has a 0-60 time of 7.3 seconds. In comparison, the Volkswagen Tiguan has a 0-60 time of 7.5 seconds and the AWD Mazda CX-7 has a 0-60 time of 7.7 seconds. With a 260 horsepower, four-cylinder engine in a compact SUV, one would expect a 0-60 time in the 6.5-second range. The Sportage SX offers great efficiency considering its power. The model weighs 3,459 pounds and comes standard with a six-speed automatic transmission. It has EPA rated fuel economy of 22-mpg city and 27-mpg highway in front-wheel drive form. The 2011 Sportage SX is offered in either front-wheel drive or all-wheel drive with MSRPs of $25,795 and $27,295, respectively. Both models come standard with power seats, power door locks, CD player, and air conditioning. Sunroof, leather seats, and a navigation system are optional features. The comparably equipped Sportage EX FWD has an MSRP of $23,295, making the SX a $2,500 price premium. The Sportage SX, like all Sportage trims, comes standard with traction control, electronic stability control, ABS brakes, and driver, passenger, and side airbags. 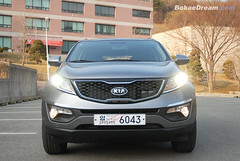 The Sportage is on the Insurance Institute for Highway Safety’s “Top Safety Picks”, making among the safest 2011 SUVs. If you want a spirited driving experience from a compact SUV, the 2011 Sportage SX represents a very good value. It costs about $7,000 less than a comparably sized, powered, and equipped Acura RDX. Some in the automotive press have criticized the SX’s steering and suspension. If you had $30,000 to spend on a new SUV, would you buy the Kia Sportage SX? We need to downsize from a 1996 Explorer V8 that has given us nearly 200,000 miles of great service. I had been comparing The Toyota RAV4 Sport V6, Hyundai Tucson, and a couple of other SUV models. I had thought that I would have certainly picked the RAV4 after the test drives, but the Sportage SX was most impressive. Unfortunately, I feel Toyota is losing market share as they delay the release of the next generation RAV4. Unfortunately I can’t wait that long. Features, fit & finish, and the generous warranty give a good reason to go with KIA.